Former UFC light heavyweight champion Jon Jones pleaded guilty Tuesday in a New Mexico courtroom to a felony charge of leaving the scene of an accident, but he avoided jail time. Judge Charles W. Brown granted Jones a conditional discharge, sentencing him to supervised probation of up to 18 months. The plea agreement allows Jones to avoid a formal felony conviction provided he meets its specified conditions. The court also granted Jones' request to not restrict travel as it pertains to his professional career. He was ordered to make 72 appearances at charity or youth outreach programs. Jones was not sentenced to any fines or fees. Shortly after he accepted the plea arrangement, Judge Brown noted, "Mr. Jones, you got real lucky." Jones, 28, pleaded guilty to fleeing the scene of a three-vehicle crash on April 26 in Albuquerque. According to the police report, witnesses said the crash occurred when Jones ran a red light in his SUV. Jones fled the scene on foot, but circled back to retrieve something from his vehicle. A pregnant woman was treated for an arm injury caused by the crash. Jones' attorney, Vincent Ward, stated Tuesday that the victim has made a full recovery. The eight-time defending UFC champion turned himself in to Albuquerque officials the following day. The UFC stripped Jones of the 205-pound title and placed him on indefinite suspension on April 28. Reebok, the UFC's exclusive apparel provider, also terminated its individual deal with Jones. In a brief statement addressed to the court, Jones apologized to the victim, the victim's family, his family and his supporters. Jones released a full statement after the hearing, through his representatives. "With regards to today's decision made by the court, I am very happy to now be able to put this incident behind me," Jones stated. "My actions have caused pain and inconvenience in the lives of others and for that I am truly sorry and I accept full responsibility. I have been working hard during this time away from my sport to grow and mature as a man and to ensure that nothing like this happens again. "I am not sure what the future holds for me, but I plan to continue to do the work needed to be productive and successful in every aspect of my life." At the time of the crash, Jones (21-1) had been scheduled to defend his title against Anthony Johnson at UFC 187 on May 23. Daniel Cormier (16-1) replaced Jones on the card and won the title by submitting Johnson in the third round. Cormier is scheduled to defend the title against Alexander Gustafsson this weekend in Houston. Jones is the first champion in UFC history to be stripped of a title for disciplinary reasons. In May 2012, Jones was arrested on suspicion of driving under the influence after he crashed his Bentley into a telephone pole in Binghamton, New York. He pleaded guilty to a misdemeanor DWI and avoided jail time. Last December, the Nevada State Athletic Commission mistakenly tested Jones for substances of abuse while he was training for a Jan. 3 title defense against Cormier. 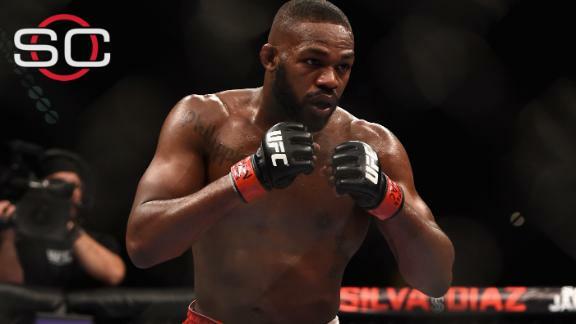 Jones tested positive for metabolites of cocaine, but was still allowed to fight; cocaine is technically not a banned substance outside of competition. He defeated Cormier via unanimous decision. During his arguments in court, Jones' attorney called the April incident a "huge wake-up call" for his client. "The UFC organization is aware that Jon Jones reached a plea agreement with authorities in Albuquerque, New Mexico, this morning stemming from charges associated with a motor vehicle accident earlier this year. As a result, UFC, through Las Vegas-based law firm Campbell & Williams, will thoroughly review the agreement before discussing Jones' possible reinstatement to return to competition." Brett Okamoto breaks down what Jon Jones' guilty plea to charges stemming from an April accident means for the fighter's future.